As someone who is a vegetarian, I am not used to finding substantial options at Central American restaurants and was very excited to try some authentic, plant-based Puerto Rican and Honduran food in the area. As a foodie, flavor has always been the most important element of cuisine for me and Casa Yari (3268 W. Fullerton Ave.) did not disappoint. Casa Yari offers some extremely flavorful food that is nearly impossible to find anywhere else because what it is doing is extremely innovative. I also appreciate that Casa Yari is BYOB, adding to its affordability. It is the perfect spot for a chill dinner with friends over some red wine. Its interior is homey: you really are at Chef Vargas’ house where you can see family photos and ornate decorations with colorful paintings adorning the wall. It’s a very down to earth restaurant that serves culinary magic without having to use bacon and cheese to be delicious. Casa Yari’s menu is quite extensive, ranging from Tapas, a Mariscos section, Jibbaritos, larger entrées, and dessert. It can feel a bit overwhelming if you’re not familiar with the cuisine but the descriptions are very thorough, with the vegan and vegetarian options written underneath each item. My advice is to try anything, you can’t really pick a bad dish. We started out with the Caribbean Nachos ($12), which is not like your typical nacho dish. It had crispy fried plantains, cheese (not the slimy nacho cheese but a cheese like Chihuahua), a refreshing Mango salsa and seasoned jackfruit. I was also excited to try the Churrasco Dinner and Mofongo since I’ve never been able to eat a vegetarian version of these dishes. The Churrasco ($16) is typically a grilled skirt steak but this one came with a Seitan steak, which was the perfect balance of crisp and moist, while being extremely palatable. It was the best seitan I have ever had in my life! The Chimichurri is also super fresh and tasty, serving a nice complement to the charred seitan flavor. I would have liked there to be more Chimichurri so I got an extra side of it because I am all about the sauce. The Churrasco also comes with mashed Yucca Al Mojo; it is akin to mashed potatoes but is made with yucca root and has a very delicate flavor. The Tostones were crispy, savory, and paired well with the garlicky Chimichurri. 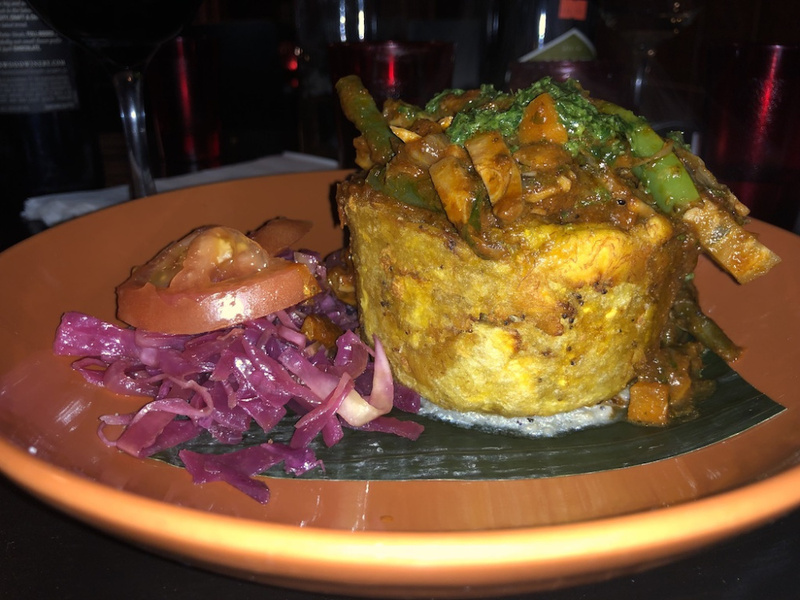 The Mofongo ($15), which is in the shape of a cylindrical ball, consisted of garlicky mashed green plantains, giving it a texture similar to mashed potatoes. It was filled delectable jackfruit and topped with their Criolla sauce, a savory sauce with tomatoes, greens, peppers, and onions. The Mofongo has so many fun and diverse textures that go seamlessly well together. The combination of mashed and crispy textures was very well-executed and satisfying! While we were all pretty full, we couldn’t leave without trying their famous flan. We decided to try their Banana Nutella flan ($7). It is sweet and decadent but not in an overwhelming way. It had the soft, jiggly texture of flan with its famous caramelized top served with fresh whipped cream and fruit. We left full and satisfied with a stomach filled with vibrant flavors and diverse textures. Casa Yari’s portions are decent but not overly large so that way you can have room for dessert. Casa Yari is an affordable neighborhood restaurant that caters to all community members. Is it the cheapest Central American cuisine in the area? No, but you can certainly find some of the most delicious Central American cuisine that is healthy and caters to all dietary backgrounds. You really do feel like you’re at Chef Vargas’ house. If you are interested in learning more about Casa Yari and Chef Vargas, please check out my story in LoganSquarist.